It's Saturday, let's take it easy, Love! My husband said in response to my litany of things to do for the weekend. "We could do grocery shopping later, for now, let's just relax"
While he and my son "relax" by watching re-runs of How I Met Your Mother or the re-cap of the latest N.Y. Yankees' victory, I found myself sorting the laundry. This was when I realized how much I have changed living here in America. It's "wild" to know that I am now wired to think that doing laundry is "relaxing". Or washing dishes can be calming, as I shared in my last post. I have turned to be so domesticated!!! You see in the Philippines, I rarely washed dishes. I never did laundry. If you think I'm sort of a princess, no I'm not. But that's just how it was in the Philippines, and it still is for a majority of the people that I know. You have an army of helpers doing stuff for you... like for each chore (laundry, cleaning, etc.) there is someone assigned to complete these tasks daily. In fact, one of my former helpers asked me on my last visit how I am surviving in this country without them. "Take me with you Ma'am", she suggested. But there is no need. We all evolve, or better yet, we upcycle ourselves to adjust to a new environment. I enjoy my life in my new home. If I didn't move here with my family, I couldn't imagine myself blogging about home-cooked food... What's there for me to share when I would probably have someone else cook for me. Then I would not have made it to the Babble's Top 100 Mom Food Bloggers (ahem, it's a shameless plug but it is Babble, an online magazine's annual search). I'm proud to be mentioned in the same league as the famous food bloggers like Deb of Smitten Kitchen and Jenny's Dinner: A Love Story. But most of all, I am proud to be the only Filipina in the list. Thank you Babble, for this is a great honor. 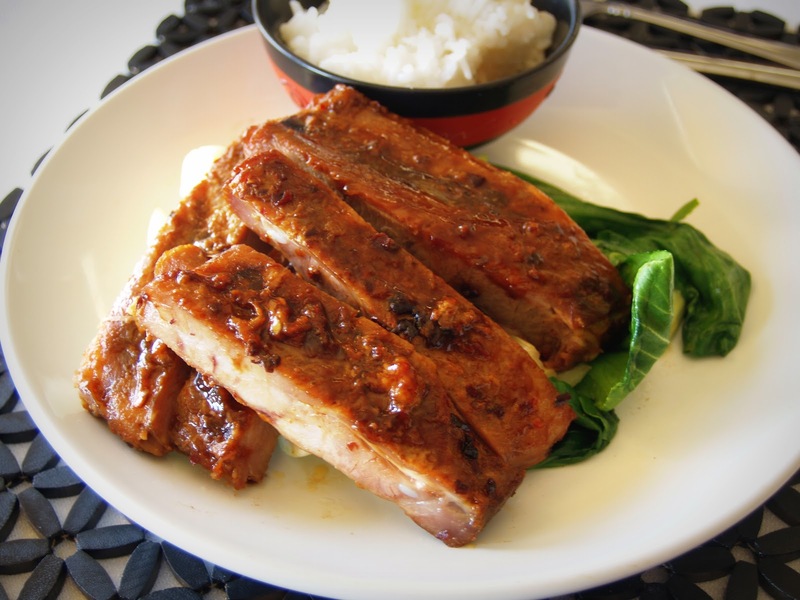 And to celebrate, I made this Asian Inspired Barbeque Ribs using my old barbeque sauce recipe from the Philippines. I shared this marinade here previously. But just as I upcycled myself, I upcycled the marinade and added Lee Kum Kee's Chiu Chow Chili Oil to give some kick to it. This chili oil contains chili, garlic, sesame oil and soy sauce. Along with the hoisin sauce, this makes for a perfect blend to provide flavor and heat to the ribs. Mix the garlic, sugar, hoisin and chili oil in a bowl to make the barbecue sauce. Once mixed, spread the sauce on each side of the slab. Apply the sauce thoroughly around the meat and leave it for an hour. It's even better if you could leave it overnight. Make sure to refrigerate the meat if you decide to leave it overnight. Set your oven to 350 degrees. Put the ribs on a pan with its arch up (like an inverted U) and cover it with aluminum foil. Bake it for an hour. If you are in St. Louis, I am excited to tell you that I will be hosting a cooking class, Everyday Asian: Spring Roll Marathon. The class will be at Whole Foods in Brentwood on Thursday July 19 at 6:30 pm. Click here to register. It will be a fun cooking activity... that's a promise! I hope to see you on Thursday... I am sooo excited! Amen to being "domesticated" LOL! I learned everything when I arrived here in the U.S. including cooking rice! Anyway, this looks really yum, just wondering if you've tried this on beef ribs? Thanks! Yes i've used it in ribs. Here's the link I was referring to above. I usually use it for beef. I hope this helps. Me too, Malou...too domesticated....haha. I was too spoilt with a helper when I was back in Malaysia. I think it's suffering here not to have one here. I still hate housework and all the ironing......aaarrrrggghhh. If only I have a magic wand....hehe. But then, like you, I'm very thankful. I wasn't recognised anywhere in the big food bloggers platform like you but I'm really happy that I started blogging which really helped me to become a much better cook, something which would be almost impossible if I am still back home. And looking at your pork ribs, I need a whole rack of it :D Hope you have a great weekend. Hi Mary,I know we have our own reasons why we left our home country, but yeah the general feeling is the same. I'm glad you could relate to the experience. Mary, you may not be recognized but you are loved by many bloggers... me included. You could tell by the long comments you receive post after post all throughout these yeares that you are blogging. Cheers Mary, we are in great company! Keep bloggin, I will be here! Congratulations Malou! I enjoy reading your blog not just for the recipes but for the stories. I am happy that big publishing companies are noticing that. You have the gift and the gab to tell your anecdotes like I already know you. I will visit you in St. Louis one of these days, because I would love to meet up with you and have coffee. You are the younger version of myself. I could see that. Kudos and more power. As I mentioned to Tita Josie on my wall post,blogging is a wonderful journey. I meet people like you (well virtually) and we cross the boundaries set by time and distance, we become friends, we share stories, we interact daily. I wouldn't trade that for anything. aww reb, you're one of the sweetest most generous blogger i've met. Great to see you! But "relaxation" for me is when my checklist is all crossed out haha. 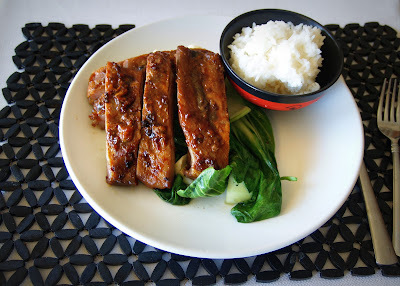 Oh my gosh, I can't resist that photo of the ribs, the rice and those greens! It's another great classic you have here, Malou! Congrats on your award! I meant to congratulate earlier, but I was running around like a headless chicken. Anyway, so thrilled, so proud, so happy for you! If you lived closer, I'd bring food to celebrate your big award!!!! Sending virtual hugs ! Just sent you a mile long congratulatory comment & I don't know if I hit the right button to "send". Also realized that I forgot to thank you for stopping by my blog & showering me with your kind comments. Happy Weekend and again, soooooo happy & thrilled you won this award. May this be the first of many more ! Wow congratulations, its people like you who makes us Pinoys proud. Mabuhay. Thanks Raymund... I share this joy and honor with you! Mabuhay! 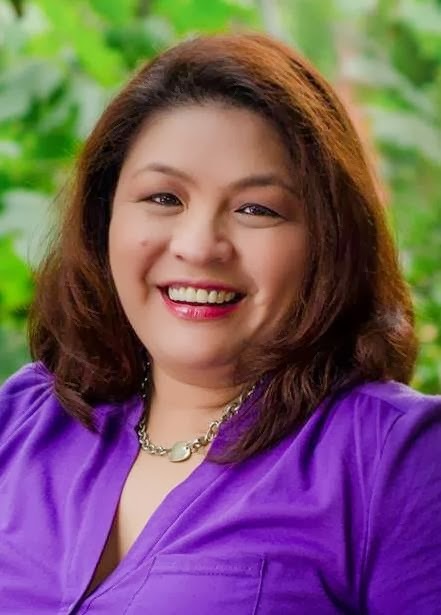 Malou, I loved reading your post about your life in the Philippines...how you were getting all the help for your household. Wow, that's awesome. Now, you are much stronger, and probably more knowledgeable, here in the U.S. Your ribs are incredibly droolworthy, and totally delicious! I'm so craving it! Congrats, on the top 100 and also for your cooking class teaching! You are all set for the summer, with your busy schedule! Hi Elisabeth, Hello my friend... your comment and your other 2 comments from my previous posts warmed my heart like no other. One of the bestest things in blogging is knowing and having sincere friends like you! You are one of my dearest friends... all the time. Thank you so much for the kind words... sending you love and smiles from STL! Hi Malou, I started following you a few days ago. I would just like to tell you that I was able to connect with you as I read paragraph 2 of your post here. My husband and 2 daughters would always tell me to sit down and watch TV with them at the living room on weekends. Great! But how exactly can I do that when it's also my time to prepare lunch? And just exactly when I finish cooking, the movie ends. The good thing is, they would rewind the movie for me to watch while they watch it the second time. :) A productive week ahead! I'm so glad to meet you virtually. Not only that, we find similar things that connect us together. Maybe it's a "wife" trait but then again, sometimes we need to take our hubs' lead to "relax" don't you think? Congrats on the Babble recognition! I'm about as far from a Mom Blogger as you can get, but even I know what a big deal that is. And I always enjoy reading about how your life in St. Louis differs from your life "back home." Good recipe, really enjoyable post - thank you. I am so thrilled to hear that you find my posts interesting. And thank you as always for coming over, commenting as it gives me the fuel to go on... and on.. and on.. haha! Congratulations Malou. You truly deserve to be on top 100 food mom blog because you inspire a lot of moms like me. Continue to share your gift. Thank you so much. I hope you are doing great! Take time to relax too ha? I am surprised myself. I know I am a small fish compared to the big guns on the blogosphere. I am grateful that Babble looked beyond stats and fan based criteria. I am just so honored to be one of the 100 top mom bloggers! Congratulations on the top 9 and for being one of Babble's Top 100 Bloggers, Malou. Truly deserved. I am glad to hear that I am not the only one who always think of my chores as an activity. Lovely ribs. I happened to find St. Loius ribs in Publix on a recent US trip and tried my hand at cooking them. They were so meaty and very delicious. Love your Asian flavours and my hungry brood will definitely go for that. Thanks Adora, I share the award with you... you who equally have the passion to share good Asian and Filipino inspired dishes. Congratulations Malou on the Babble recognition!!! An honor indeed, and very well deserved. Your post is heartwarming... and so true. Not only for one who has moved from another country, but also for those of us who have simply grown up and evolved into a similar place as you. I can identify! If someone told me 20 years ago where I would be today and what would make me happy I would not have believed them. And your recipe as well... I'm thinking this one would please my entire family. Thank you!! Isn't it amazing how life evolves? (I think folding laundry is relaxing.) Congrats on your recent honors - well-deserved and so lovely for you. Your ribs call out to me - the photo should become reality. I'll be thinking about you tonight at Whole Foods, Malou. Alas, other plans prevented me from signing up. I do hope to see the recipe you make tonight on your blog in the future. These ribs look succulent. I actually find washing dishes to be very relaxing as well...but laundry I HATE! Congratulations on Babble Malou! Only Filipina! Whoo hoo! I love ribs and your Asian BBQ sounds terrific! I have never prepared ribs like these at home. Looks wonderful!! Wait a minute, your cooking class? I want to join!! Too bad it's not around here, otherwise you can count on one familiar face (= me)! Have fun at the class - you will be natural and students are so lucky!! I am planning for a BBQ in a nearby park in a few weeks and your rib recipe looks to delicious to pass by. Hoisin sauce is something I use very often but what is the Chui Chow chili oil? Thanks for the recipe! Hi YI! here's the linky for the Chui Chow Chili oil http://pocketsoflove.wordpress.com/2010/04/10/sweet-chili-dipping-sauce/lee-kum-kee-chiu-chow-chilli-oil-big/ this sauce is addicting haha.